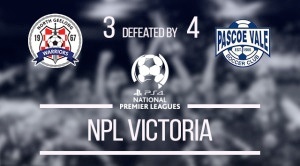 North Geelong has ended up on the wrong end of a 4-3 scoreline for the second week in a row, this time going down to Pascoe Vale in a dramatic encounter at Elcho Park on Saturday evening. A sensational second half hat-trick from midfielder Joseph Youssef, coupled with a first half strike by Jake Nakic, was enough to give Pascoe Vale a thrilling victory over the Warriors. North midfielder Reardo Luka had the opening scoring chance of the game in just the second minute; his thunderbolt from 25 metres desperately punched away by Paco goalkeeper, Alex Pavlidis. It was to be one of the few clear cut scoring chances in the opening stages of the first half. Then, as the game threatened to break out into a yawnfest, a goal for either side within the space of 60 seconds ignited the contest. In the 29th minute, the vistors took the lead from a goalmouth tap-in by tall striker Jake Nakic. The celebrations lasted less than 60 seconds, as the action immediately swung to the other end with the league's leading goalscorer Robert Zadworny adding to his season's tally with a delightful chip over the rushing Pavlidis. The second half was almost a carbon copy of the first, with the game fast deteriorating as a spectacle. That was, until complete madness struck Elcho Park in the space of just five minutes. In the 61st minute, a wonderful Josh Pugh free kick from 20 metres out gave the home side the lead, albeit temporarily. Less than 60 seconds later, Joseph Youssef leveled the scores with the first of his three for the afternoon. Youssef’s precise header from a 66nd minute corner gave the visitors the lead before North striker Mark Paleka leveled the scores in the 73rd minute. In a real see-sawing affair, it was left to Youssef to have the final say in the 79th minute, with yet another inch perfect header from a corner securing a vital three points for the away side. North Geelong: 1 Antonio BARESIC, 2 Darren LEWIS (4 Nikola JURKOVIC 81’), 3 Matt TOWNLEY, 18 Stipe TRBUHOVIC, 6 Hugh PUGH, 7 Reardo LUKA, 16 Michael GRGIC (9 Tomislav TRBUHOVIC 81’), 14 Mark PALEKA, 23 Michael ANDERSON (21 Matija DRAGOVIC 68’), 10 Rob ZADWORNY, 11 Juso JULARDZIJA.